We, as a nation, love applied physics. If anything, that’s all that sports are. With the Houston Astros on the brink of advancing further in the 2015 Major League Baseball playoffs, take a look at this physics-based pitching preview of tonight’s American League Divisional Series Game 5 matchup between the Astros and the Kansas City Royals. My baseball coach growing up was my friend’s dad, named Paul Mancillas. He loved to say that hitting was timing and that pitching was about disrupting that timing. He could not have been more correct. Baseball is a sport in which a fraction of a second can mean the difference between hitting a home run and swinging and missing a pitch. The announced starter for the Astros is Collin McHugh, who was the winning pitcher in 19 games during the regular season as well as in Game 1 of this series in Kansas City. He relies on four types of pitches: a four-seam fastball, a curveball, a cutter, and a changeup. 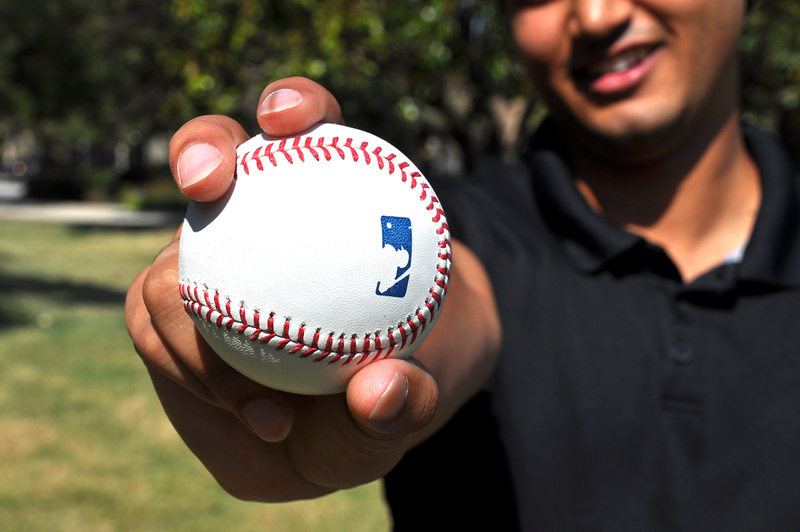 The grip for a four-seam fastball sets two fingers across the stitching, held horizontally. The grip launches the ball into a backspin, causing greater acceleration through the air. Photo by: Jason Schaefer. McHugh throws his fastball at approximately 90 miles per hour. This means that the ball will travel the 60 feet, 6 inches from the pitcher’s mound to home plate in approximately 458 milliseconds! Astros hitters will have even less time to react; the Royals’ expected starter Johnny Cueto throws his fastball at around 93 mph, so it will reach home plate in about 444 milliseconds! An average MLB player can locate the moving baseball in about 140 milliseconds and swing his bat in approximately 150 milliseconds. So subtracting that away from the previous numbers, the batter has about 150 milliseconds to make the decision to swing or not swing at the pitch. Take too long to make the decision, and you swing too late and miss the pitch or foul it away to the opposite side. But if a pitcher only throws fastballs at the same speed, he becomes too predictable, and a batter can easily time his swing to make good contact. That’s where the other pitches come in. A wider, more even grip across the stitching makes a changeup move more slowly. Photo by: Jason Schaefer. A changeup is a pitch that looks like a fastball while moving but arrives at the plate much more slowly. McHugh and Cueto each throw a changeup at around 83 mph, which travels to home plate in approximately 497 milliseconds. A batter expecting a fastball would start his swing 50 milliseconds early and, instead of hitting the ball with the fattest part of the bat, miss the pitch completely. 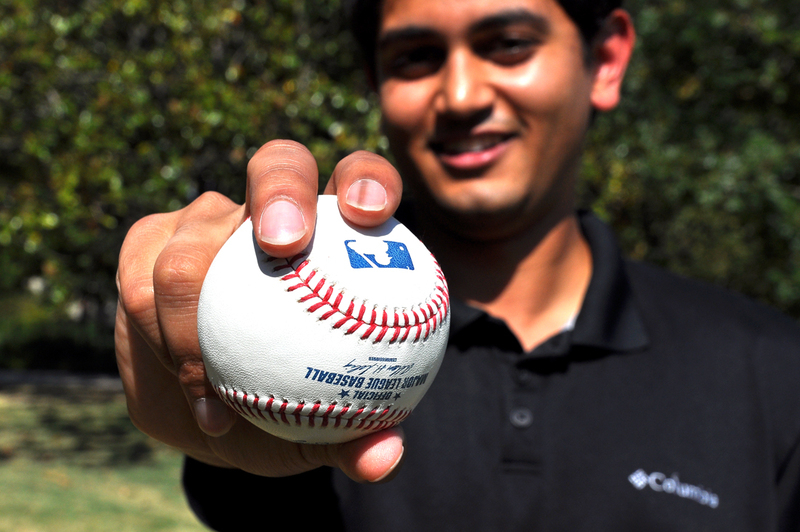 For a cutter or cut fastball, a slightly off-center grip causes the ball to curve right just before crossing the plate. Photo by: Jason Schaefer. In addition to changes in speed, some pitchers rely on pitches that move horizontally or vertically. McHugh throws a cutter, or cut fastball, which has the speed of a fastball but moves horizontally right before it reaches home plate. 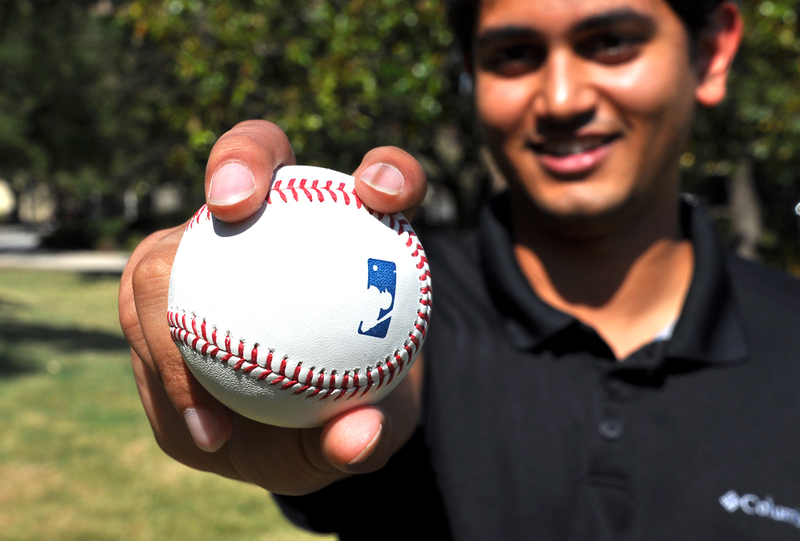 A pitcher would hold the ball similarly to a fastball, but with a slightly off-center grip. Since a batter’s timing won’t be disrupted by a change in speed, this pitch is designed to create weaker contact with the ball. The barrel of the bat would be in one place while the ball would be in another, usually resulting in an easy-to-field ground ball. 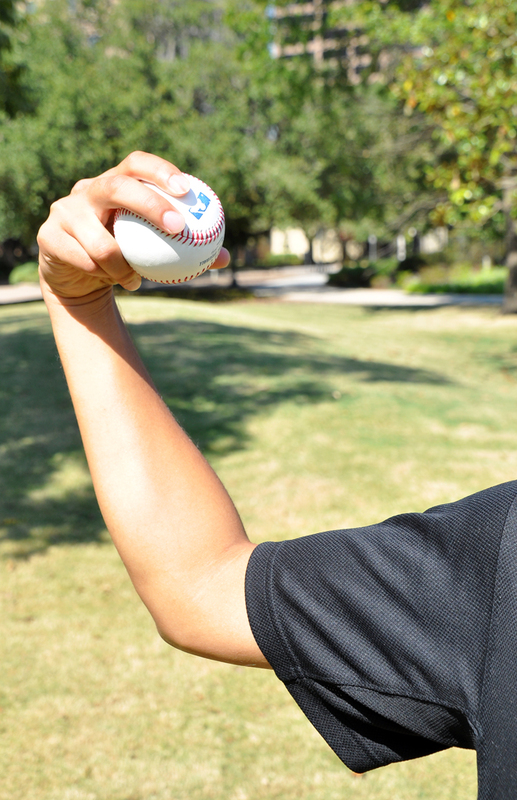 A curveball relies on a different grip and throwing technique to achieve changes in both movement and speed. Photo by: Jason Schaefer. Combine movement with change in speed to get the deadly curveball. A great curveball has what’s called 12-to-6 motion, meaning that it dips straight down as if going from the 12:00 position on a clock to 6:00. This occurs because of the spin of the ball. The rotation of the ball causes the air around it to rotate as well. 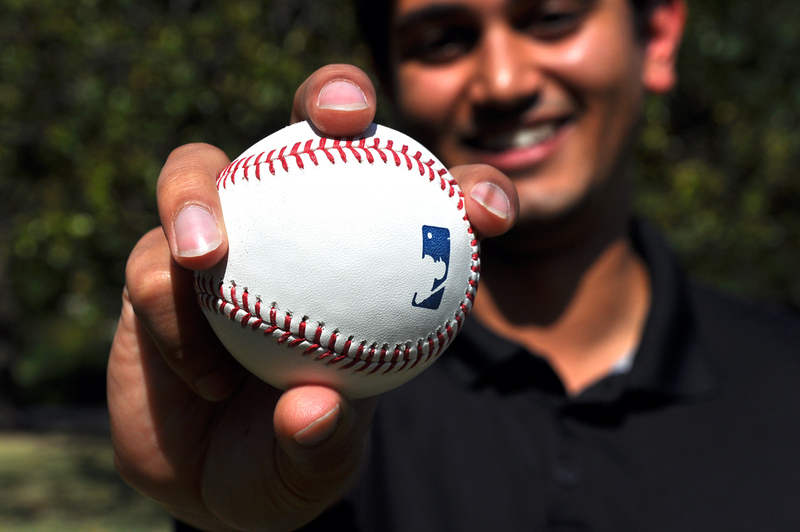 As the air is ejected on the upper side of the ball, the ball itself moves in the opposite direction, downwards. This is Sir Isaac Newton’s Third Law of Motion in action! Proper curveball pitching technique calls for a sideways release of the ball. Photo by: Jason Schaefer. In addition, many pitchers throw a curveball at least 10 mph slower than their fastball; McHugh actually throws his at around 74 mph, which reaches home plate in about 557 milliseconds, about 100 milliseconds slower than his fastball! The combination of reduced speed and change in direction makes hitting a curveball challenging for batters of all kinds. The most important feature of the baseball to pitchers are the seams, those red stitches that hold the ball together. The stitches themselves create a disturbance in the air molecules around the ball, resulting in a clean pocket for the baseball to travel through with less resistance. This allows the ball to reach greater speeds. 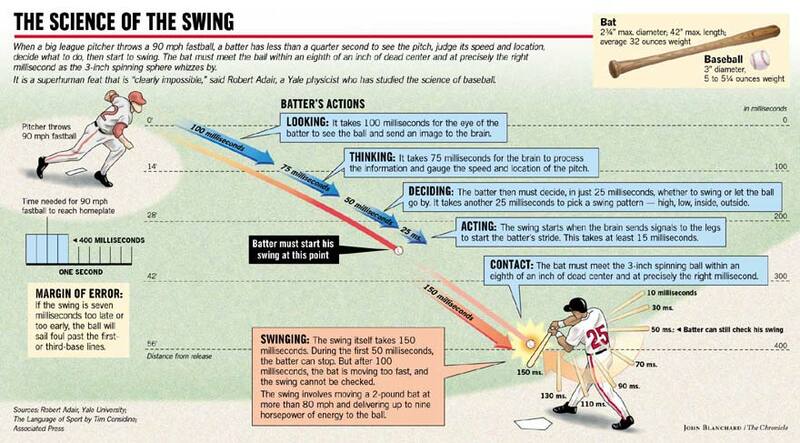 Want to see if you can hit a major league fastball? All you need is a ruler and a friend! Have your friend hold the ruler in the air, and position your finger and thumb around the 0 centimeter mark. Tell your friend to drop the ruler at some point without telling you when, and try to catch the ruler between your fingers. Note the position of your fingers on the ruler; if you caught the ruler in 11 centimeters or less, you have a reaction time of about 149.8 milliseconds, which would be just fast enough to hit a 90 mph pitch! Now you just have to work on swinging the bat in 150 milliseconds, too, and maybe you could be the next big thing on the 2016 Houston Astros! Next Post Come to Energy Day for a fun look into the future (and for funnel cake)!